Our chain of medical supply stores is growing across the region to give you, our customers, easy access to our products and a savings as well. We maintain a commitment to the health and well being of our customers, and that promise is the secret to our success. Our staff members are always on hand to ensure accurate communication and a high level of comfort when speaking with you. Whether visiting one of our stores in person or viewing our products online, we invite you to have a look at our great selection of products and services. We have a wide selection of familiar favorites as well as some appealing new items! Savon Medimart was introduced to provide a cash-and-carry outlet that serves the growing segment of the population with no health insurance or those with unreasonably high deductibles. With higher insurance deductibles and medical coverage dipping lower, many people are struggling to pay for necessary medical equipment and supplies. 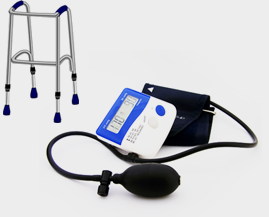 Savon Medimart is dedicated to selling quality hospital-grade medical equipment and supplies at more affordable discounted rates. necessary medical equipment and supplies. We appreciate your business! Remember, we're not just a medical supply store! We're your neighbor and friend! Secure Ordering...Items placed in your shopping cart will be securely processed when you place an order. A padlock icon viewing in your web browser bar should be viewable during this process. If we ask for your email address, it is to further process your order. We will never share or sell your personal information. Savon Medimart stores honor cash, checks and major credit cards.